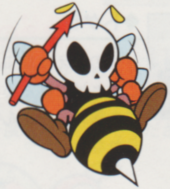 A Skeleton Bee is an enemy in Super Mario Land 2: 6 Golden Coins that appears in Area 4 of the Tree Zone, and like Bībī and Būichi, it can only be found in this particular stage. The Skeleton Bee is tougher than their non-skeletal counterparts, as they can come back to life after Mario defeats it. Doing a Spin Jump or using a Star are the only ways to defeat them permanently. Also like their counterparts, they appear out of the hives in the background and move very slowly. In official artwork, they appear to have a normal, non-skeletal body; however, in gameplay, the bottom half is able to be seen through as if they are completely composed of bones. Skeleton Bees flying in an "O" formation. The ? Block can be seen through the Skeleton Bee's body. ↑ Super Mario Land 2: 6 Golden Coins English instruction booklet, page 13. ↑ Super Mario Land 2: 6-tsu no Kinka Japanese instruction booklet, page 16. ↑ European instruction manual of Super Mario Land 2: 6 Golden Coins, page 57. This page was last edited on October 30, 2018, at 23:15.